Do you ever wonder how an airplane makes its way from the factory to the airport? Well, we found out recently when Cathay Pacific invited TravelSkills aboard the “delivery flight” of its fiftieth Boeing 777-300ER aircraft flying from the factory in Seattle to Hong Kong. The sneak peek flight was a special experience for invited media, travel agents, and top Cathay customers to sample the carrier’s products while also witnessing an important milestone for both Cathay Pacific and Boeing. 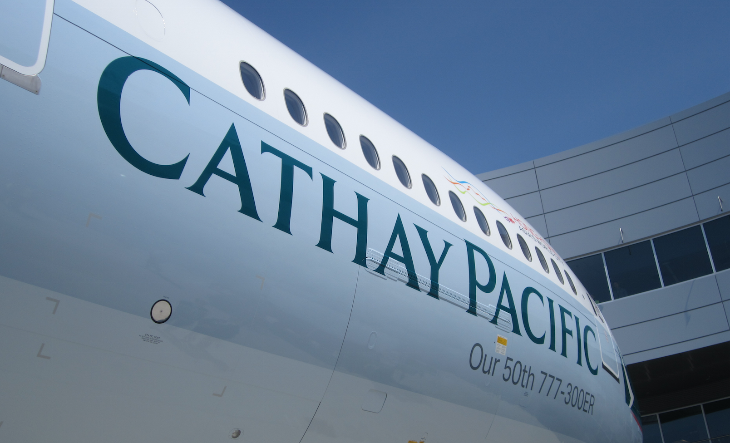 With the largest fleet of 777s among Asian carriers (67 in total), and the second largest in the world (behind Emirates), Cathay Pacific is an important Boeing customer. 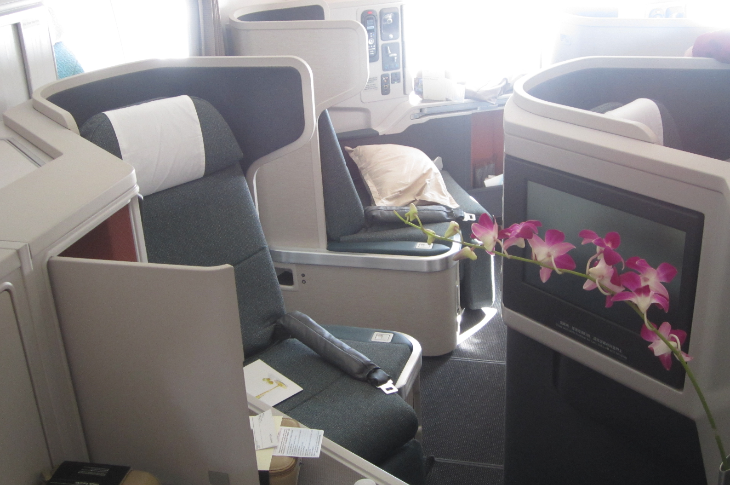 In fact, Cathay Pacific launched its newest route from Hong Kong to Boston on the day after the delivery flight. All airlines handle their delivery flights differently, and Cathay wanted to make this a special occasion given this was their fiftieth 777-300ER. Also parked nearby during the ceremony was a Lufthansa Boeing 747-800 aircraft and a Turkish Airlines Boeing 777-300ER. Both planes were making their own delivery flights that day, but with decidedly less fanfare. It was especially interesting to learn that new aircraft are delivered to airline customers almost daily, sometimes two or three per day. That’s why Boeing built this special Boeing Delivery Center building with two jet bridges, numerous meeting and banquet spaces, and a Boeing collectibles shop. The space is often the location for celebratory events, and full catering facilities are in place. Before boarding, a Boeing executive thanked Cathay Pacific for a strong partnership over the years and spoke briefly to the crowd waiting to board the plane. 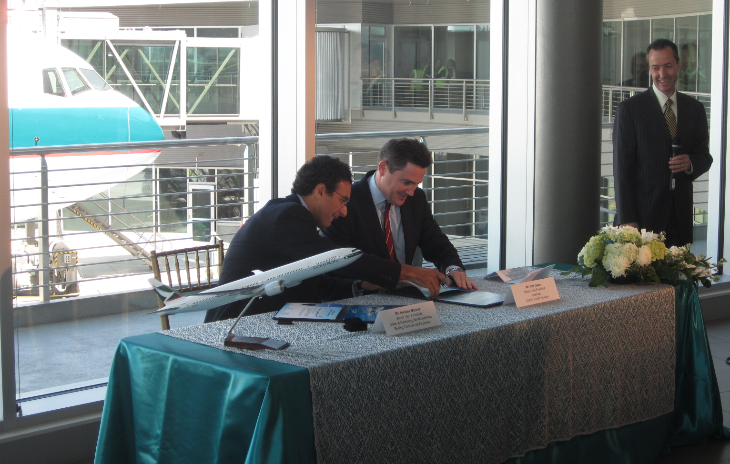 With the giant Boeing 777-300ER in the background, Boeing gave Cathay executives a ceremonial key. More like a car or house key, the symbolic gesture signals the official ownership by the airline. On the tarmac, all those that were traveling aboard the flight gathered around for a ribbon cutting ceremony. Most unique was that all received boarding passes with the city name “Boeing Paine Field” to Hong Kong. With only about 50 passengers on board a plane designed for 330 people, the delivery flight was like having your own personal plane. Following a tarmac tour of the plane and plenty of photo opportunities, passengers went through a security check. The Boeing Delivery Center is equipped with two short jet bridges making the experience similar to an airport, but far more festive. 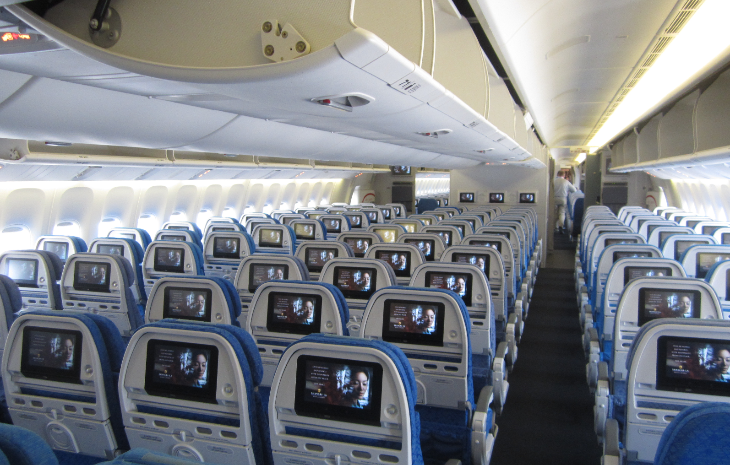 All of us were seated in the herringbone-style business class cabin, which features enormous entertainment screens and flat-bed seating. The back of the plane was empty, almost eerie to see, but everyone was free to wander around the aircraft at any time. 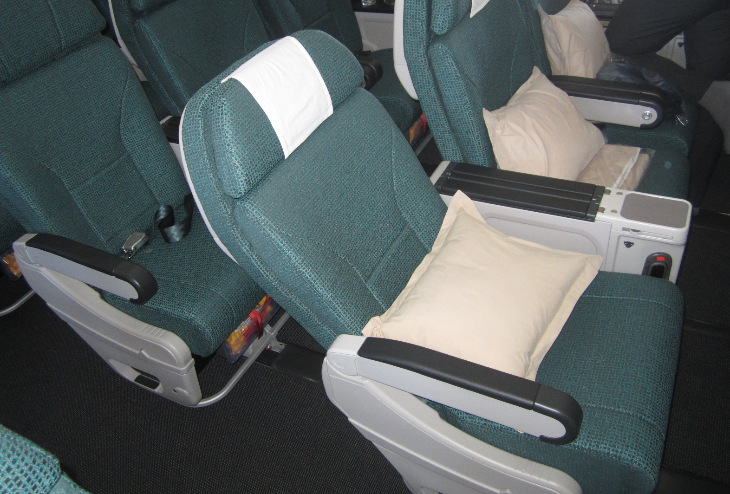 Cathay has had strong success with its new premium economy cabin, and after testing it out, it is clear why. The recline is almost double that of the standard economy seat, and since it is situated in its own mini cabin behind business class, it seems quieter and more intimate. Other than the free reign that travelers had on board, everything else was standard procedure. The safety video played as the aircraft taxied to the runway with Boeing employees standing on either side of the taxiway to wave goodbye. Cabin crew, specially selected to work this important flight, were as gracious and hospitable as can be. And that is not easy on a flight like this one where passengers spend hours wandering up and down the aisles, enjoying cocktails and wine while chatting with other passengers, and poking around all parts of the plane in exploration. Many passengers donned Cathay’s pajamas distributed prior to take off, which was a special treat since they are typically reserved only for first class passengers. 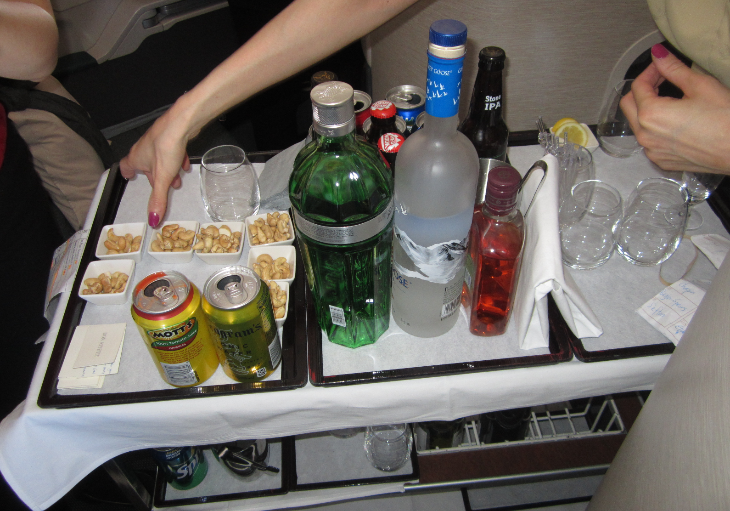 Cathay began the first meal service with cocktails delivered from a two-tier cart and warm cashews. This is followed with an appetizer and salad tray. The main course is served from the same two-tier cart with all of the options on display. This is a really nice way to allow passengers to choose their meal since they can see what everything looks like before ordering. A cheese and fruit course follows with cordials and chocolates. 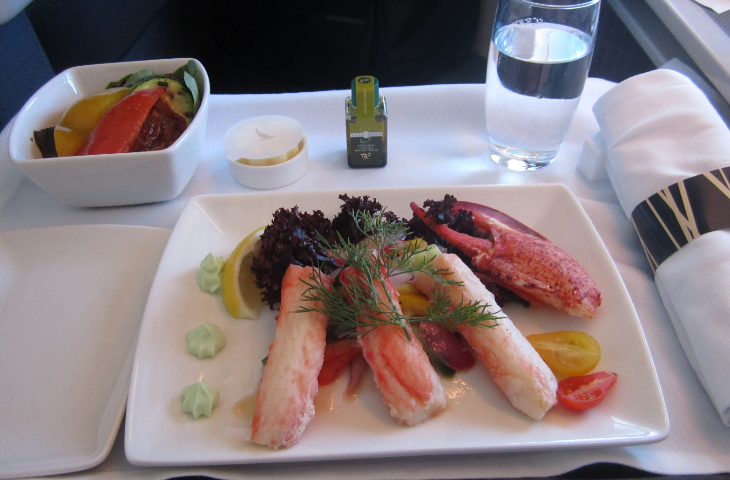 Throughout the flight, snacks were available from the menu, and two hours before landing another hot meal was served. Many passengers enjoyed themselves so much that the 13-hour flight passed too quickly– with only a few frequent naps and snacks in between. Since this was a special experience, Cathay allowed us into the cockpit during flight to chat with the pilots and get a birds-eye view of the Pacific Ocean on this mostly daytime flight. 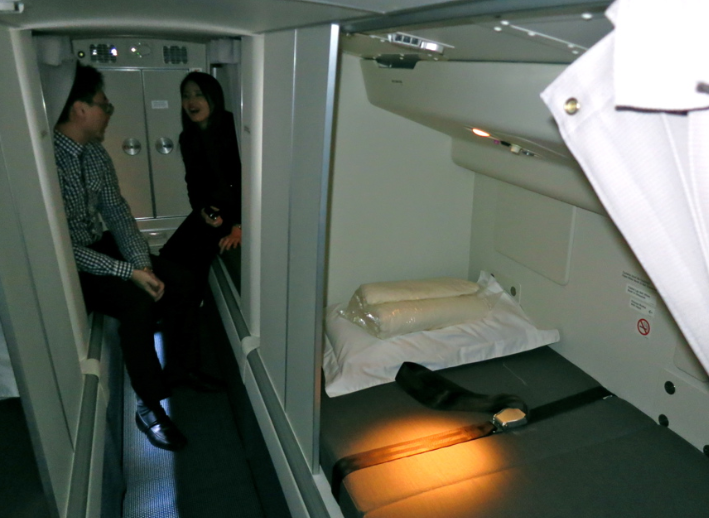 Photos were not allowed, but on landing, passengers were permitted to snap photos of the crew bunks. They are located in the back of the plane up a steep climb of stairs. Having to duck down to pass through the narrow corridor, there are nearly a dozen bunks with curtains for privacy. Upon arrival in Hong Kong our shiny new 777 pulled up to a standard gate on arrival, and passengers deplaned like any commercial flight. Cathay Pacific really impressed us with the detail they took to make this iconic delivery a special experience for everyone involved. NOTE: Be sure to click here to see all recent TravelSkills posts about: Star Wars invade DEN + United’s new 50,000 mile bonus + Secret stash of hidden hotel deals + Big new carrier for ATL+ Roomier widebodies on domestic flights!